Under water coral, Great Barrier Reef. © Troy Mayne. 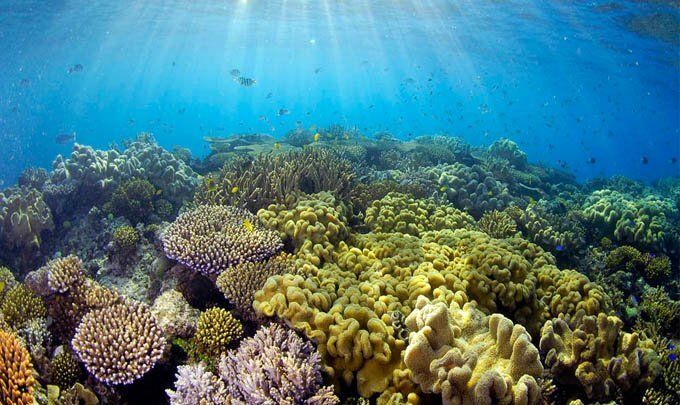 WWF-Australia said the draft Reef Water Quality Improvement Plan, released this week by the Queensland and Australian governments, is far too vague and ignores scientific advice. “There is no meaningful detail on the actions and investment needed to deliver promised cuts to Reef pollution,” WWF-Australia spokesperson Sean Hoobin said. The World Heritage Committee flagged its concern over Reef water quality at its annual meeting in July when it stated: “…progress towards achieving water quality targets has been slow, and the most immediate water quality targets set out in the 2050 LTSP are not expected to be achieved within the foreseen timeframe. “The World Heritage Centre and IUCN consider that the implementation of the Plan will need to accelerate to ensure that the intermediate and long-term targets of 2050 LTSP are being met, in particular regarding water quality. “This plan appears to ignore the concerns of the World Heritage Committee,” Mr Hoobin said. Mr Hoobin said one major positive is that the draft Plan contains catchment specific pollution targets for the first time. “However, there’s no blueprint for achieving these catchment targets and that’s very disappointing,” he said. Mr Hoobin said to achieve the target of reducing pollution by 50-80% by 2025, the plan should name the eroded rivers and gullies that must be repaired to cut sediment pollution and set out a large-scale investment program to achieve this. To reduce fertiliser pollution, farmers should be offered low interest loans to update farm machinery and purchase technology to make the use of fertilisers and irrigation more efficient. Farmers should also be paid for significant water quality improvements. Mr Hoobin said these kinds of detailed actions could have been included because the work has been done. “The Reef Science Consensus Statement – released today – and numerous other reports, set out clearly the actions and investment needed to achieve pollution targets yet the draft Reef Water Quality plan ignores them,” he said. Comments close on the draft Plan on October 10.